Varian E-4 EPR Spectrometer is under conversion to FT-EPR spectrometer. Details will be made available when the instrument is fully operative. The Quanta 200 FEG scanning electron microscope (SEM) is a versatile high resolution scanning electron microscope with three modes of operation, namely, the high vacuum (HV) mode for metallic (electrically conducting) sample, low vacuum (LV) and environment scanning electron microscope (ESEM) modes for insulating, ceramic, polymeric (electrically insulating) and biological samples respectively. 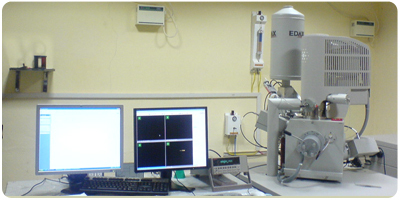 Apart from giving the high resolution surface morphological images, the Quanta 200 FEG also has the analytical capabilities such as detecting the presence of elements down to boron (B) on any solid conducting materials through the energy dispersive X-ray spectrometry (EDX) providing crystalline information from the few nano meter depth of the material surface via electron back scattered detection (BSD) system attached with microscope and advanced technological PBS (WDS) for elemental analysis. General Size:. Any dimension (Height or Diameter): Less than 10 mm. The ideal shape of a sample is that of a button on your shirt. However, other sizes can also be accommodated only after a discussion with the system operator. Utility:. This accessory is used for determining % concentration of elements on the surface of metallic specimen. Limitation:A minimum of about 1000 ppm concentration of each element is required for detection on a metallic specimen of preferred size with finely polished suface. Interested users can contact the scientist-in-charge, Mr.Sivaramakrishnan.